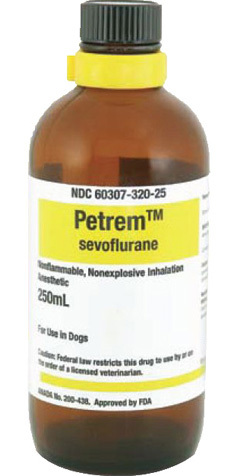 Petrem™ Sevoflurane - JD Medical Dist. Co., Inc.
JD Medical is very pleased to announce that we now offer generic Sevoflurane. Minrad released Petrem™ Sevoflurane late last year and it is now available to our customers and veterinarians everywhere. The generic Sevoflurane is exactly the same Sevoflurane you have been using for years sold by Abbott and Baxter but it comes at a significant price savings and with the world-renowned JD Medical customer service and support that you have come to know. Despite some of the negative campaigns and information put out by Abbott and Baxter to keep veterinarians from flocking to a cheaper alternative drug, the Sevoflurane from Minrad is no different. The Lewis Base chemistry they use to convince you is a farce and the same chemistry applies to their product which they of course leave out. It only applies if the Sevoflurane becomes contaminated which, given the strict regulations and the fact that the Petrem™ Sevoflurane is the only Sevoflurane manufactured in the United States, is a case that would be extremely rare. Most of us in the US have seen the problems with pharmaceuticals and products made in other countries with looser regulations. All of this adds up to Petrem™ Sevoflurane being an extremely reliable and affordable product that humane doctors have been switching over to in huge numbers, in fact, last year the human version of Sevoflurane took over 17% of the Sevoflurane market share in the US. If human physicians are saving significant amounts of money and seeing great results, don’t you think it’s time that veterinarians start saving as well? Contact us online through the website or Facebook, or call us for more information and to begin ordering Petrem™ Sevoflurane from JD Medical! We are currently adding more information including access to the product inserts and literature explaining generic Sevoflurane. Generic Sevoflurane is extremely safe and will not damage your equipment. It is made to very exacting specifications and the process to make it was designed by the inventors of Sevoflurane itself. Contact JD Medical directly or fill out a request form by clicking HERE and we will provide the information you request immediately.